Who’s Writing Books For Kids in Singapore? When we were growing up, the bookworms among us devoured Famous Five, Hardy Boys and Nancy Drew stories. It was great to read about their exciting adventures, but deep inside we were always aware that the books came from a different world, one where boarding schools, baseball games and horse riding were a part of life. 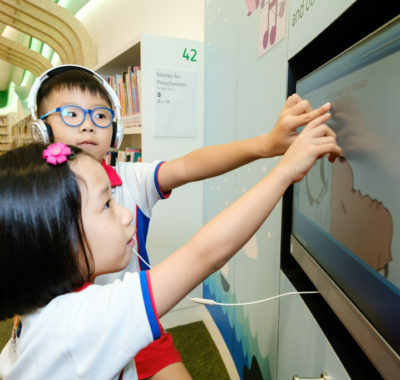 Kids in Singapore today, however, are entertained by books that are written especially for local readers. Recently, a new generation of authors has stepped up to publish stories that feature familiar street names, beloved delicacies and distinctively local traits. Through these books, our children are encouraged to develop their reading, writing and thinking skills within the context of their own local identity. Hopefully, they will grow up with a richer appreciation of our way of life, and a greater desire to be creative and imaginative. Here, we interview three authors who are helping to inspire this new generation of bookworms. Eliza, 41, is an editorial consultant, children’s book author and “very naggy mother of two girls” (13 and 10 years old). She is also the author of the bestselling Ellie Belly series which charts the silly and funny antics of Ellie and her best friend Cammy as they go about saving a different animal in each book. How did you get started writing books for kids? I started writing the Ellie Belly series two years ago as an experiment. I told myself that if it didn’t do well, I would stop and go back to writing corporate annual reports. As it turned out, it did do well and I have just finished writing my sixth Ellie Belly book. It will be released in October. How is local culture featured in your series? Before I started writing, I noticed a lack of children’s books set in Singapore. My girls were reading books such as Judy Moody, Horrid Henry, Junie B Jones. And I was getting tired of answering questions like: Mama, what is third grade? Mama, how come we don’t have Independence Day? All the books my kids were reading featured settings that were foreign to them. So, I was determined to set my story in Singapore. Most of the action takes place in a very familiar local school setting involving teachers giving worksheets, recess, PE (physical education), health education and so on. The title character Ellie lives in an HDB flat and goes home to a domestic helper. These are settings that a Singapore child can identify with. The kids love it, because they are able to picture the scenes clearly. I have had some kids tell me that they love Ellie Belly because she is just like them! What do you enjoy about writing for kids? Children are so responsive and honest. They give honest feedback. The Ellie character is loosely based on my daughter Ellie, who is really silly, eccentric and strange. I also love telling kids that the animals featured in my book ¬ Snowy the dog and Taffy the rabbit – are based on my real-life pets. What’s next for Ellie Belly? I have just finished my sixth Ellie Belly book. It is called Ellie Belly: Mousey Mayhem. I am also looking forward to helping my 13-year-old daughter Gabby launch her first Young Adult title. The first part Run will be launched in October. Any tips on how to choose books for young readers? 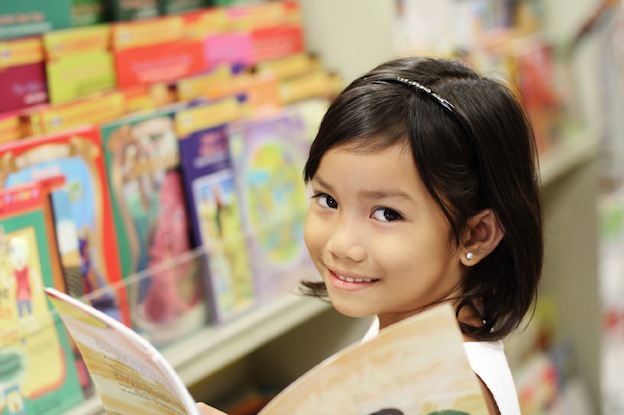 The most important thing is to choose books according to your child’s interests – not your own. It’s important to get the child used to holding a book and reading it. Even a graphic novel is fine for reluctant readers. A graphic novel still beats a video game. Ellie Belly books are available at bookstores like Popular, Times, and Kinokuniya and online at Bubbly Books. Eliza’s younger daughter Ellie has also set up her own ecommerce website selling used toys, clothes and books, as well as new copies of the Ellie Belly series. Adan (originally from the US) is a freelance writer, editor, and creative writing instructor. His wife Felicia is a book merchandiser. They say that they are both enormous geeks. They have published three Sherlock Sam books so far, and the next one, The Alien Encounter in Pulau Ubin, will be out in October. Epigram Books was looking for somebody to write stories about a chubby kid detective character. We pitched a series idea, they loved it, and so Sherlock Sam was born. Kids like to read about places they’ve been to and know well. So all the Sherlock Sam stories are set in Singapore. The Supper Club in the book is multi-ethnic, like Singapore, and the stories always feature local food and places that children can visit if they want to learn more. There was a six-year-old British boy who’d been in Singapore for only six months. His dad said that when he saw the books in the store, he was very excited because he could read about the new place that he lived in. That they don’t ever have to be talked down to because they’re a lot more clever than people give them credit for. Don’t get too hung up on how educational a book is. If a child wants to read a book, let him read it. The more children enjoy reading, the more they will see it as a recreational activity instead of something they have to do. This means they will read more on their own and learn tons along the way. What’s next for Sherlock Sam? We’re putting the finishing touches on Sherlock Sam and the Alien Encounter in Pulau Ubin. Sherlock Sam books are available in almost every bookstore in Singapore. You can also meet Sherlock at his website and on Facebook. Don, 42, used to work in a variety of jobs — publishing, educational technology, lecturing — but now he runs Super Cool Books as a joint venture with his sons (9 and 7 years old). Their earliest releases were the Time Talisman and Sherlock Hong series which both mixed historical fiction with mystery and adventure. Other titles include The Diary of Young Justice Bao, My Blade Quest, Ghostly and Gung Ho Vs Zombies. Two years back, my older son who had just picked up the reading habit asked why none of the cool books were set in Singapore. He found out that I had some publishing experience, and wanted me to write and publish such books for him and his friends! A few days later when I was at a meeting with the publisher at Select Books about another project, we started talking about ideas for kids’ books set in Singapore. We ended up launching the first Super Cool Books title, The Secret of Monk’s Hill. Many of our books have a h3 historical element, like the Time Talisman series, and the Sherlock Hong series. These take readers back to Singapore’s old colonial days two centuries ago, when Singapore was an exciting trading centre and merchants travelled here from all over. Other titles like My Blade Quest and Ghostly are set in current times and feature local landmarks, foods, legends. Some parents have said that although their kids didn’t like to read, they were somehow captivated by my books and asked for more. This is great to hear, because we include a lot of features that are designed for reluctant readers, such as shorter paragraphs, less cluttered pages, and the ability to follow our stories on smartphones or tablets. It’s such a joy to share what I’ve learnt in life — everything from trivia, to life skills, character values, advice on dealing with disappointment — and package this in a fun reading experience, with mystery and adventure and humour. I also create free worksheets and learning materials, which are available on our website. Start with the themes that your child might be interested in, like sports or travel or comedy. Let them read two or three chapters, and then allow them to stop if they aren’t interested. This will help them to be more open about sampling new books. Once in a while, they’ll find a series that excites them, and that’s when they’ll really bury their noses in the books. What’s next for Super Cool Books? We have our iPad bookstore app coming out. This allows you to buy our ebooks at just $1.28 each. We’re also launching a new series called Gung Ho Vs Zombies, which comes with a simple DIY electronics toy kit. This series is designed to get children interested in science and technology. Paperbacks by Super Cool Books are available at National Library branches. They are also sold at major bookstores and through Select Books. Here’s another children’s book author, Leana Lyn Doray, whose books are complemented with an educational reading pen too!